A great cultivated variety of evergreen succulent bred to withstand our colder winters. 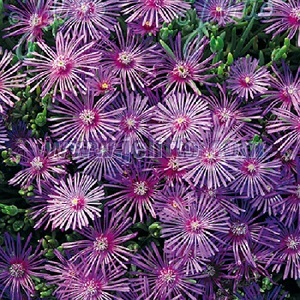 This is a low growing Ice Plant with succulent green leaves and masses of large purple/scarlet flowers in summer from May to August. These are spectacular plants in full flower, forming a mass of colour. They look best in dry and Mediterranean gardens and are good pot and balcony plants. Delosoperma grows best in sun and well-drained soils. The plants survive cold UK winters best when the soil is free draining. They are heat and drought tolerant. Flowers open in the sun. 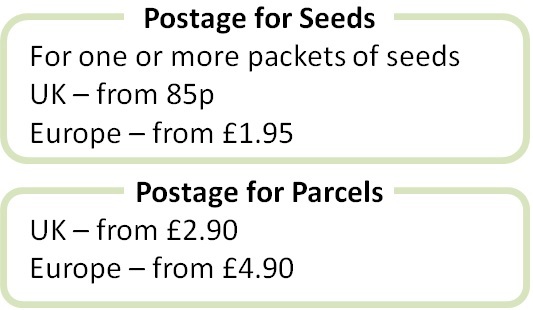 Pack of approx 100 seeds (naturally small seeds). Sow anytime, typically in spring to autumn. Sowing instructions and a colour photo are printed on the packet. Conditions Sun and well-drained neutral to acidic soil. Sow anytime, typically in spring to autumn. Sow the seeds thinly on the surface of a tray of seed compost. Press the seeds gently in the compost, keep moist at around 20°C and germination takes 1-2 weeks. Move seedlings into small pots when they are big enough to handle and then outside or into containers. Protect autumn sowings in a greenhouse or cold frame before planting out in spring. Grow Grow in a sunny situation. These are evergreen plants and only need tidying up after the flowers have faded. Mature plants can be divided after flowering or in spring, and stem cuttings taken in early summer.